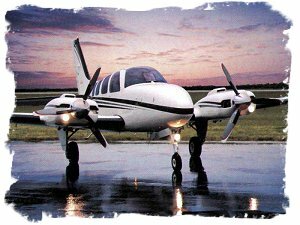 A couple of years ago I got a call from a gentleman in Brazil, inquiring about a Cessna 210 that I was advertising. Roberto Martins lived near Sao Paulo and was a farmer who worked a 21,000 acre farm, raising cattle and soy beans, and he was also a pilot that needed an airplane to cover the vast distances of his country with it's scattered population centers. Over the next few weeks we had several conversations by phone about the 210, and finally a deal was struck for him to purchase the airplane and begin the process of getting the ship ready to export to Brazil. While first time aircraft buyers are usually surprised at the simplicity of the paperwork involved in purchasing an airplane in the US, a Bill of Sale signed by the previous owner along with an Application for Registration and five bucks. The whole thing sent to the FAA in Ok City and the deal is done. It is quite another thing to export or import an aircraft. Each country has its own rules and standards and only experience in doing it makes it routine. Neither Roberto nor I had sent an airplane to Brazil and we both struggled with the certification. Mistakes were made and corrected and the whole ordeal took longer and cost more than it should have, but finally it was finished. Roberto's pilot came and collected the airplane and made the long flight to it's new home, and that, I thought, was that. The total unpredictability of life has always fascinated me, sometimes horrified me, but never bored me. This time it pleasantly surprised me when I recently received another call from Roberto. He said I had done such a good job for him on the 210 that he wanted me to find him a Baron. It didn't feel to me like I had done a good job on the 210, but I'd done my best and maybe that is what he was thinking about. I appreciated the second chance. I began looking for the Baron that would best fit his budget and his mission and at the same time be the best value for the dollars spent. The quest took several months, but finally I located the airplane that both Roberto and I thought might be the one. It was a 2004 model with only 375 careful hours on it since it rolled out the factory doors and it was owned be a national equipment company that had spared no expense to maintain it. It was based in Phoenix and Roberto and I agreed to meet there and examine it. In the meantime I arranged a prebuy inspection and the airplane got kudos from the shop that looked at it. It apparently really was the airplane the specifications and the pictures said it was. Roberto and I met at the company's hangar in Phoenix in October, a first meeting for us after many phone conversations, and he proved to be just as I'd imagined him; a courtly gentleman of my years, very much at home in the world. The hangar was the real surprise, as it tturned out to be an aeronautical Taj Mahal and was worth the trip to see, even if the airplane had been a dud. Millions had been spent to make it a showplace and the Baron, far from a dud, sat gleaming on its polished floor, looking as nearly new as a five year old airplane can. OK. And a few weeks later, after applying and waiting for a Visa, I find myself southbound. And here is the story of that flight. Morning dawns gray and windy. A strong front has pushed through West Virginia overnight, bringing ferocious winds that still roar in the bare trees on the hill above the farm house. Russell brings me to the airport in his pickup and I ready the Baron and load my baggage. The weather briefer gave me little hope for a fast first leg of this trip and my destination of Fort Lauderdale lies some five and a half hours away, a distance that I could make in three and a half if the winds were behind instead of in front of me. The Barons engines start easily despite the brisk temperatures and the long taxi to the runways departure end warms and readies them for the run up. I go through the departure check list as the wind tries to whip the control yoke from my hands, then Im ready, and I line up on the runway and advance the throttles. I accelerate and lift off quickly into a troubled sky and Im quickly immersed in the murk. The trip has begun. 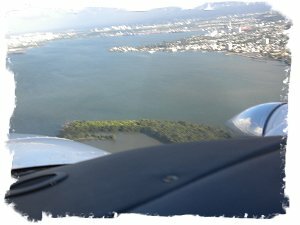 Direct from Philippi ­to Ft Lauderdale takes you quite far out to sea and as my flight left land behind in the Charleston, SC area, I decided to ask for lower than my eight thousand in an effort to reduce the relentless headwind. I asked for and received six thousand and no sooner was I there and my ground speed had started to increase, than I was given a turn to the west and even more into the wind. This in order to avoid an active military area, and my speed fell 20 knots from my speed at the higher altitude. Rats. Passing the Florida line the afternoon thunderstorms made their appearance and I was kept busy with the radar and with wending my way between the cells. Ft. Lauderdale was in the clear however, and I made the visual approach and landed. 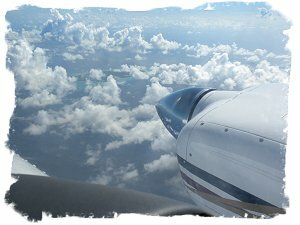 The island of Nassau is piled with a meringue of brilliant and blossoming clouds, the kind you know are filled with rain and turbulence and other nasty things that pilots try to avoid, and the controllers incessant chatter with the areas aircraft confirmed that they have a thunderstorm in progress. My flight path takes me directly over the island, and my radar shows a growing protoplasm of flashing red and yellow where my flight would go. I request a deviation for weather from center and am granted a deviate as necessary from the harried controller. Now past the weather I watch from my perch at eleven thousand feet the islands of North Eleuthera, then Eleuthera slide by my left wing. Next Cat Island appears and the water surrounding it starts to take on the travel poster hue of aqua that one associates with the Bahamas. Now the ride is smooth at eleven, with small, scattered cumulus clouds far below and blue sky above and ahead. Ive always found flying at altitude to be dehydrating, especially in the southern climes and Im well prepared today. I have a gallon jug of water for intake and a pilots relief tube for outgo and life, at this moment, is good. Resting on the floor is the yellow inflatable vest that Ill slip on if things go very wrong, and in the back is a similarly colored four man raft. Passing the tiny islet of Rum Cay my ground speed is holding at 180 knots, indicating that the wind is directly on my right wing, neither helping nor hindering my progress. I have the Baron set for long range cruise, using just 24 gallons of fuel per hour as opposed to the 32 Id be using at normal cruise, and at this setting my endurance is almost seven and a half hours. My expected time to San Juan is just over five hours, giving the comfortable reserve that I like. This Baron is well set up. The gages showing the engines vital signs are mirror images of each other and the throttle, propeller and mixture levers line up exactly. Its a pleasure to fly this almost new airplane and it takes me back to the five years that I flew for Cessna Aircraft. Twins were my responsibility and I flew them all and they all were all new. None had more than 50 hours and most were test flight time only airplanes, which means I got them with five hours or so on the clock. I much prefer an airplane with a few hundred hours of time, one that has been sorted out and tweaked by a knowing mechanic, as this Baron has been. As it is with humans and animals, the birth process is traumatic for airplanes too, and they are not at their best immediately afterward. At almost four hours into the flight I pass the island of Grand Turk, where I stopped for fuel in 1996, enroute to Puerto Rico with Bodacious to do a month of airshows for a political party. At about this point my ground speed drops almost 20 knots as I fly into the influence of the Trade Winds and my estimated time enroute grows to 5:50, but I still should land with a very good reserve. Now at 5:15 hours into the flight I am 90 miles out from the airport of Isla Grande, where I based in 1996 and which is my destination today. The airport lies in a bay only a stones throw from where the cruise ships dock. Ive passed between several building cumulus that pulsed red on the radar, but other than minor deviations I havent been bothered by the weather. Im close enough now to pick up the ATIS and it gives the weather: Winds 090 at 17, Visibility 10 miles, light rain, ceiling 3,000 scattered, 5,000 scattered. Ill take it! Im 10 miles out now and I can see where the bay comes curving around to form the beautiful harbor with the white splash of down town San Juan in back of it. The airplane sinks as I curve around to line up with runway 9 and I go through the pre landing checklist, then double check gear down. Finally, the Barons tires touch wet tarmac, and I am back in Puerto Rico once more. Memories of an earlier time come rolling back and things seem comfortable and familiar. I fuel the Baron and arrange for its overnight lodging in the Millionaire Hangar, then I have a cup of coffee and wait for my friend Maria, who will pick me up.